Jacob Jabez Wolffe (1876 – 1943), son of a Glasgow jeweller, made 22 unsuccessful attempts to swim the Channel from 18 July 1906 to 15 July 1914. He made three attempts in 1906. Two in 1907. Four in 1908. Two in 1909. 2 in 1910. Two in 1911. Two in 1912. One in 1913 and one in 1914. The first World War then put a stop to his attempts. 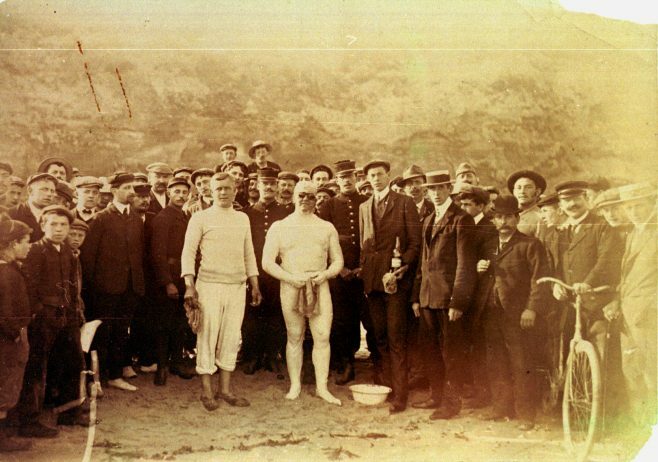 He swam a double Solent in June 1914. After the War he trained Gertrude Ederle on her unsuccessful attempt in 1925. He then trained three successful Ladies; Hilda Sharp, Aug 1928. Peggy Duncan Sept 1930, and Sunny Lowry Aug 1933.